15 May 2014: RWS dolphin death: Time to ban swim with programme - Today Online. 13 May 2014: Fourth Resorts World Sentosa dolphin dies - Yahoo News. 13 May 2014: Death of dolphin at RWS spurs calls to free others - The Straits Times. 13 May 2014: ANOTHER DOLPHIN DEATH AT RESORTS WORLD SENTOSA: TOTAL DEATH TOLL 4 - The Real Singapore. 14 January 2014: Conservationists find Marine Life Park partnership with Conservation International puzzling - Yahoo News. 6 January 2014: S'pore to host animal welfare conference - The Straits Times. 16 September 2013: RWS dolphins get full attention - The Straits Times. 08 December 2012: RWS' top man defends dolphin plan - The Straits Times. 25 November 2011: RWS' actuations suggest it has something to hide - Inquirer Opinion. 24 November 2011: RWS: Our dolphins are in a well-established facility in the Philippines - Yahoo News Philippines. 22 November 2011: Wildlife activists campaign to save the ‘world’s saddest dolphins’ - GMA News. 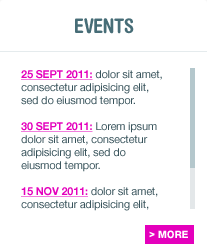 22 November 2011: RWS insists it will not hold animal shows - Yahoo News. 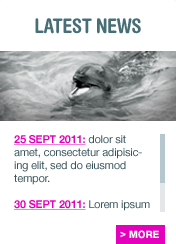 20 November 2011: Animal groups seek return of Solomon dolphins in Subic to their native habitat - Yahoo Philippines. 19 November 2011: What's there to hide? - The Philippine Star - Yahoo Philippines. 19 November 2011: ACRES flims training session of RWS wild-caught dolphins but told to leave - The Online Citizen. 12 November 2011: Animal rights group seeks release of Ocean Park Dolphins - Philippines Daily Inquirer Global Nation. 28 October 2011: ACRES to RWS: Set the record straight - TODAY. 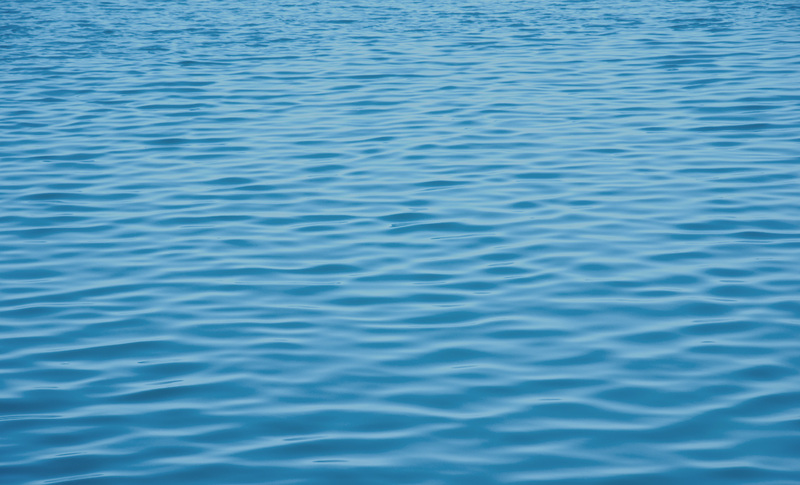 21 October 2011: Swim at RWS or in the ocean? - TODAY. 20 October 2011: Does RWS really have world-class treatment? - TODAY. 19 October 2011: RWS' dolphins are for economic greed, not conservation - TODAY. 07 October 2011: Ric O'Barry: We can save the planet by controlling our desires - The Online Citizen. 06 October 2011: Unlocking the secrets of Dolphin - Gate - Pets Magazine. 06 October 2011: 'The Cove' Star Takes On Resorts World Sentosa In Bid To Free Captured Dolphins - Asian Scientist. 05 October 2011: Marine Life Park is committed to marine conservation and research - The Online Citizen. 05 October 2011: Dolphin catcher-turned-activist nets audience of 500 - TODAY . 04 October 2011: No debate on dophins - TODAY. 04 October 2011: Dolphin activist O'Barry Visits Resorts World Sentosa - The Wall Street Journal. 06 Sept 2011: Animal rights activists flood RWS facebook page with messages - The Straits Times. 06 Sept 2011: ACRES accused of 'cyber attack' - TODAY. 06 Sept 2011: ACRES accused of 'cyber attack' - Channel News Asia. 06 Sept 2011: RWS suspends FB comments over 'cyber-harassment' - Yahoo News. 02 Sept 2011: Happy Humans Sad Dolphins - GoodPapers. 01 Sept 2011: Can a concert bring freedom to 25 dolphins - X-Ray Mag. 29 August 2011: Dolphins and captivity don't mix - The Online Citizen. 29 August 2011: 1,000 gather to petition against dolphin enclosure - Yahoo News. 26 August 2011: Animals have a right to be free - The Straits Times. 26 August 2011: Animal rights group presses presidential candidates for views - The Straits Times. 25 August 2011: Presidential candidates share views on dolphin captivity - Yahoo News. 21 August 2011: Why Acres is against Resorts World Sentosa's dolphin plan - wildsingapore news. 21 August 2011: Abetting species extinction and animal suffering, Guilty - Yawning Bread. 19 August 2011: Thousands to Gather at The Speakers Corner to Urge Resorts World to Let The Dolphins Go. 18 August 2011: Of animals, rights and moral agency - wildsingapore news. 11 August 2011: IR's dolphin plan faces global heat. My Paper. 11 August 2011: More oppose plan for dolphin exhibit at Resorts World Sentosa. The Straits Times. 10 August 2011: More oppose RWS plan for dolphin exhibit - The Straits Times. 09 August 2011: ACRES to hold dolphin concert at Singapore's Hong Lim Park - Asian Scientist. 08 August 2011: 100,000 petition for release of dolphins - AsiaOne. 08 August 2011: 100,000 petition for release of dolphins - Solomon Star. 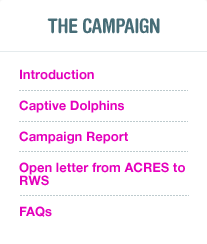 04 August 2011: RWS responds to dolphin petition - Yahoo News. 04 August 2011: More than 100,000 people against dolphins in captivity at RWS - Yahoo News. 27 June 2011: Resorts World Sentosa: Petition by 650.000 people to let dolphins go not received. The Online Citizen. 05 June 2011: Dolphins in captivity live longer: RWS. The Straits Times. 02 June 2011: Animal rights' group takes RWS to task over dolphins. Today. 02 June 2011: ACRES continue pressure on RWS to free dolphins. Channel News Asia. 02 June 2011: Acres urges Resorts World Sentosa to retract its call for more dolphins to be collected. 30 May 2011: The Dolphin Project makes proposal to RWS over dolphins. The Online Citizen. 30 May 2011: Push to free 'World's Saddest Dolphins' from Singapore theme park. The Sydney Morning Herald. 29 May 2011: Activist's appeal to RWS - Free the Dolphins. The Straits Times. 28 May 2011: Group uses social media in bid to free dolphins. The Straits Times. 28 May 2011: We have followed the rules regarding our dolphins RWS CEO. Today. 27 May 2011: ACRES needs your help to 'Save the World's Saddest Dolphins'. The Online Citizen. 27 May 2011: Singapore theme park urged to free dolphins. MSN News (The Philippines). 27 May 2011: Undercover videos released to back freedom for RWS dolphins. Channel News Asia. 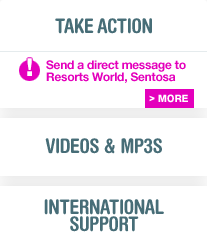 27 May 2011: First-ever music campaign to free Resorts World Sentosa dolphins. March to June Issue: Let them live wild and free - Clubpets. 14 January 2011: Langkawi dolphin pens 'appalling'. The Straits Times. 12 January 2011: Dolphin were kept in appalling conditions. Today Online. 20 December 2010: RWS urged to make "moral decision". Today. 18 December 2010: Dolphins bound for RWS die, activists up in arms. Today. Your chance to meet Ric O'Barry in Singapore on Tuesday 4th October!.